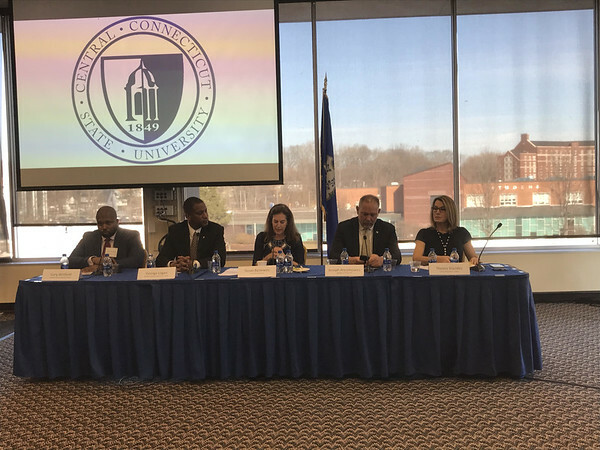 NEW BRITAIN - Several influential legislators participated in a panel discussion at Central Connecticut State University Monday, discussing how to tackle the state deficit, among other issues, and to reflect upon the 2018 election. 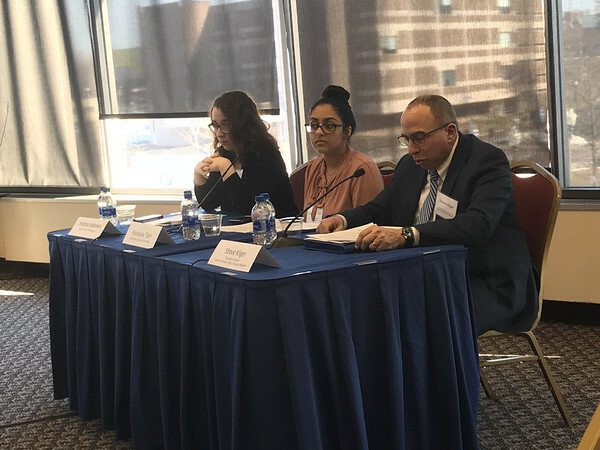 The panel discussion, “Connecticut Government in Transition,” was sponsored by the CCSU Student Government Association and the Center for Public Policy and Social Research. Participants included Senate Chief Deputy Majority Leader Gary Winfield, D-New Haven, Assistant Senate Republican Leader George Logan, R-Hamden, Democratic Lt. Gov. Susan Bysiewicz, House Speaker Joe Aresimowicz, D-Berlin, and Republican House Leader Themis Klarides, R-Derby. Bysiewicz said creating good-paying jobs that attract young people and keep them in the state will eliminate the deficit. “We need to create a pipeline from school to work with apprenticeship and internship programs for IT jobs and advanced manufacturing,” she said. Aresimowicz said that there are “no more easy cuts” and he hopes that there will be a bipartisan effort to solve the deficit. Klarides criticized Democrats for “trying to raise taxes,” “forcibly regionalize schools” and “make the state more difficult to live in.” She argued that people want to be able to provide paid family medical leave “in a perfect world,” but that legislators also need to consider if businesses will be able to afford it. “The question should not be ‘Do you support it?’ but ‘How do you support it?’” she said. When asked to reflect on the 2018 election, Bysiewicz and Aresimowicz said that there was “record turnout” as a negative backlash against President Donald Trump. Klarides said that people should have evaluated Republican candidates on their own merits rather than voting against them in protest of Trump. She argued that they were only hurting their own pocketbooks. Aresimowicz said voters looked at candidates as individuals instead of succumbing to anti-incumbent sentiment based on former Gov, Dannel P. Malloy’s low approval rating and how long it took to pass the last state budget. Bysiewicz said voters wanted paid family medical leave and increasing the minimum wage to $15. Logan blamed the 2018 election results on Republicans not campaigning enough in urban areas. Tahir asked the legislators how they could make college more affordable. She said that students typically incur more than $4,500 in debt per semester at CCSU and that the state provides less financial aid than the national average. Bysiewicz argued that community college should be free. Aresimowicz agreed and said that the state had worked to align curriculum between community colleges and universities so more credits transfer over. Klarides said Republicans support a “learn here, live here” plan, which would see students provided with interest free loans if they buy a home and stay in the state. Logan said he wanted to explore options like tuition freeze, reducing tuition increases and partial loan forgiveness. Vakhman asked what the legislators could do to stimulate job growth. Aresimowicz said spending caps and bonding caps, passed last session, will bring fiscal predictability for businesses. Winfield said that there needed to be more of an effort to “sell” the state to businesses outside Connecticut. Logan argued that the state needed to “look at existing regulations” and be careful about making new ones. He said the state needs to limit unfunded mandates for municipalities. Kliger asked the legislators to discuss the sales tax. Bysiewicz said she supported prison reform with “second chance” policies that could allow people to be productive again. Aresimowicz said there should be more early intervention to educate kids about the dangers of abusing opioids. Bysiewicz said opioid abuse decreases in places where marijuana is legalized, such as Colorado. Winfield supports tolls depending on where they are placed. Logan said he is not in favor of tolls and Aresimowicz supports them. Bysiewicz said she and Lamont favor tolls for commercial trucks only. Posted in The Bristol Press, General News, on Monday, 4 February 2019 21:18. Updated: Monday, 4 February 2019 21:20.